KINTYRE’S young athletes raced ahead of the opposition to dominate in the Argyll final of the sports hall athletics at Atlantis Leisure in Oban. 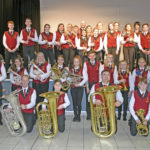 Some 113 young athletes entered the final, which was the last in a series of five competitions held in Argyll over the winter months promoted by Mid Argyll Athletic Club. 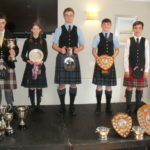 During almost five hours of intense competition, five Argyll age records were broken with youngsters from Kintyre dominating in both the boys’ and girls’ events. Kirstie Renton from Campbeltown finished just behind the top performer of the day on overall points, winning the javelin, triple jump and speed bounce, and placing second in four events in the under nine category. Kirstie broke the Argyll age record in the speed bounce, recording 77 jumps in 30 seconds. Violet Campbell, from Glenbarr, won the long jump, triple jump and javelin to become the under-11 champion. Jenny Semple from Campbeltown Grammar was the girls under-17 champion. Kintyre’s young boys were victorious as well, with one new record set by Jack Green from Dalintober primary. Jack won three of the five events in the under-seven age group, setting a new Argyll age record in the two lap race recording 27.8 seconds to improve the existing record by almost two seconds. 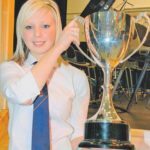 Jack was watched by his proud mum Laura Paterson, who was the under-nine Argyll champion back in January 1995 at the first ever winter indoor competition. Lochlain Ellis from Campbeltown was the under-13 champion, winning six of the seven events. The organisers would like to thank all the young athletes and parents for supporting the competition.